Cold Spring Harbor Laboratory (CSHL), the renowned institution where Nobel laureate Dr. James D. Watson gave the first public presentation of the discovery he and fellow scientist Dr. Francis Crick made of the structure of DNA, is launching a $200 million capital campaign to fortify and expand its leadership role in making groundbreaking research discoveries and developing innovative technologies to study the fundamental aspects of human health. The campaign will enable CSHL, home to seven Nobel Prize winners and recently ranked #1 in cited research in molecular biology and genetics by Science Watch, to make substantial increases in laboratory space, create endowed research centers to support innovation and growth, and provide funding to recruit talented scientists. Dr. Bruce Stillman, Dr. James Watson, Suzanne Wright, and Bob Wright. 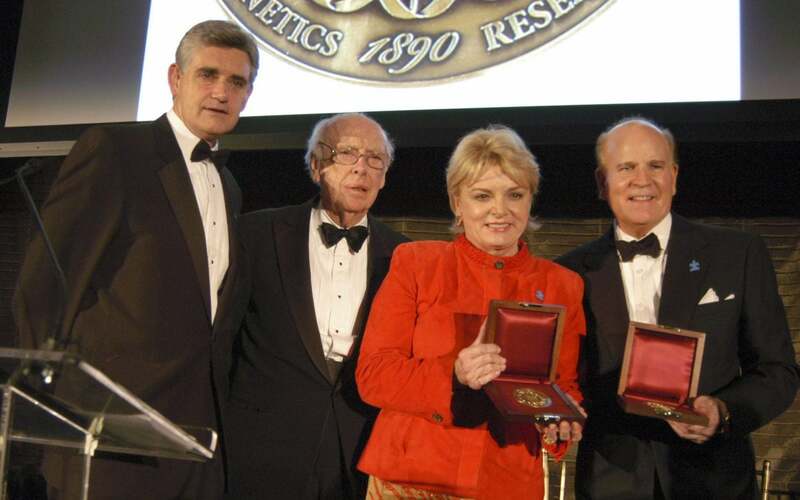 The campaign was cited at CSHL’s inaugural Double Helix Medals Dinner tonight at the Mandarin Oriental New York. 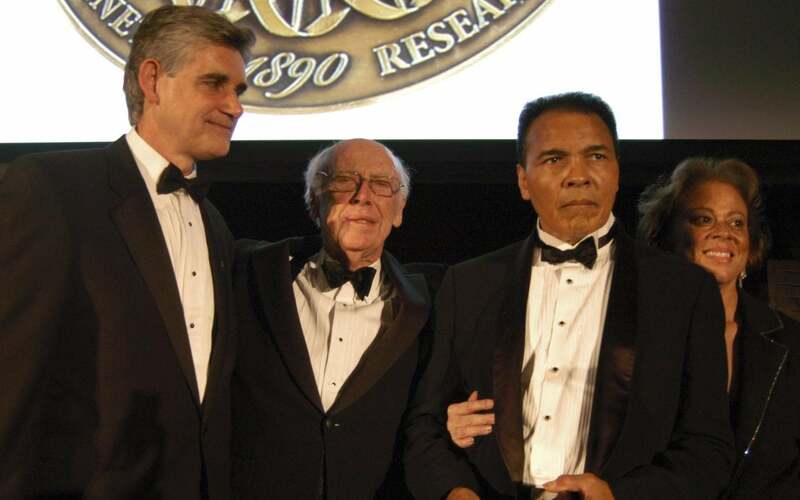 The black-tie gala honored boxing legend and humanitarian Muhammad Ali; Bob Wright, chairman and CEO of NBC Universal, and his wife Suzanne; and Nobel laureate Dr. Phillip Sharp of MIT. The double helix refers to the unique structure of DNA molecule, which carries all of life’s information. It is central to biological research, and is at the heart of the CSHL’s work. Mr. Ali was honored for his public campaign against Parkinson’s disease. The Wrights, founders of Autism Speaks, were cited for their important work in bringing a national spotlight to autism. Dr. Sharp was saluted for his lifelong contributions to biomedical research which have led to a greater understanding of cancer and genetic diseases. 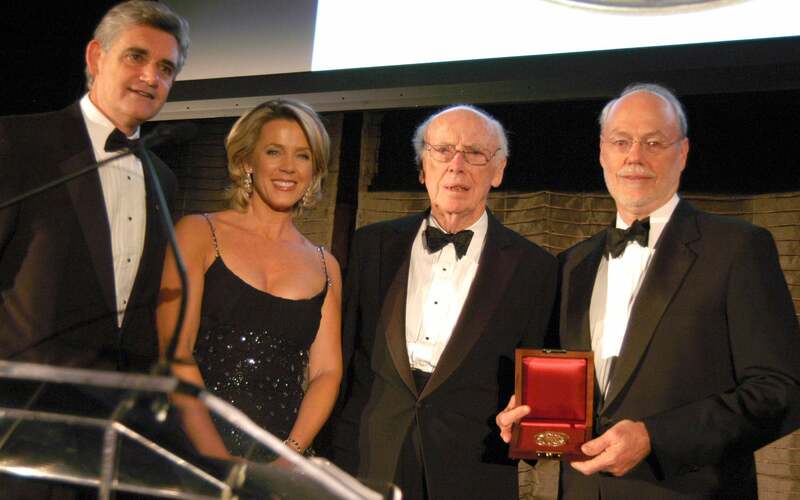 Among the medal presenters were Emmy Award winner Meredith Vieira, co-host of NBC’s “Today” and host of the syndicated “Who Wants To Be A Millionaire”; longtime TV journalist and Emmy Award winning talk show host Phil Donahue; Emmy Award winning journalist Deborah Norville, host of the syndicated “Inside Edition”; and Dr. Watson, who is CSHL’s Chancellor. Attendees included actresses Jane Krakowski (“30 Rock”) and Jenna Fischer (“The Office”) and actor Haley Joel Osment (“The Sixth Sense”). The dinner was chaired by Jeff Zucker, CEO of NBC Universal Television Group, and his wife Caryn; Thomas Quick, retired vice chairman of Quick & Reilly/Fleet Securities, Inc., and a Trustee of CSHL; David Rubenstein, a CSHL Trustee who is co-founder and managing director of The Carlyle Group, and his wife Alice; and Roy Zuckerberg, a CSHL Trustee and senior director of Goldman Sachs. Some $2.5 million was raised at the dinner to benefit CSHL’s groundbreaking biomedical research, innovative technologies and educational initiatives seeking to understand and identify therapeutic approaches and cures for devastating diseases such as cancer, autism, schizophrenia, Alzheimer’s and Parkinson’s, among others. CSHL has already raised $130 million in the silent phase of the capital campaign. It is customary for institutions to have about one-third to one-half of the campaign completed before making a public announcement. Major capital and endowment gifts include: $20 million from New York State for campus construction; $15 million from the Starr Foundation, which will go toward cancer genetics; $10 million from the DeMatteis Family, whose name will appear on a building for human genetics research; $10 million from Donald Everett Axinn for research into cognitive disorders; and $10 million from David H. Koch for biomathematics research. Bruce Stillman, Dr. James Watson, Muhammad Ail, and Lonnie Ali. “It gives me a great sense of pride to help Cold Spring Harbor Laboratory expand its facilities for groundbreaking research in Parkinson’s, Alzheimer’s, autism and schizophrenia,” said Donald Everett Axinn, who has made a contribution toward research on cognitive disorders. Cancer – Studying the molecular processes that give rise to cancers and using technologies to improve diagnosis, identify drug targets, and develop therapies for breast, ovarian, prostate, lung, skin, pancreatic, colon and brain cancer, as well as leukemia and lymphoma. Neuroscience – Seeking the molecular and physiological basis of brain function to understand cognition and neurological diseases such as autism, schizophrenia, depression, Parkinson’s, Alzheimer’s, ALS, Fragile X, multiple sclerosis, muscular dystrophy and other disorders. Plant Biology – Studying genes fundamental to growth and development to understand biodiversity and combat malnutrition, as well as developing technologies that can be applied to human genetics. Bioinformatics – Applying computer-based technology to store, organize, analyze, and disseminate biological data, including information about gene sequences and functions. In addition to its research, CSHL maintains a number of renowned educational programs, including The Watson School of Biological Sciences Doctoral Programs and The DNA Learning Center, the world’s first public center for genetics education for students, science teachers and the general public. Thomson ISI, a scientific performance evaluator, recently ranked the Laboratory #1 for cited research in molecular biology and genetics (ahead of such vaunted institutions as MIT, Stanford, Harvard, the Salk Institute, Rockefeller University, and University of California-San Francisco). The Laboratory’s Cancer Center has been ranked one of the top in the country by the National Cancer Institute.